Monaco Urbanisation En Mer project model, 2007. Plexi, mylar, and gatorboard. 24 x 16.5 x 24 inches. Courtesy of the artist and Leslie Feely Fine Art, LLC. Photo credit: Gehry Partners. A selection of Frank Gehry process models will be on display at Leslie Feely Fine Art from April 11 to June 30, 2013. Drawn from significant constructions and concepts of the architect’s prolific career, these organic forms stand as testament to Gehry’s tactile approach, enhancing our perception of this sculptural architect and his work. Projects on view include the California Aerospace Museum and Theater (1984), the Winton Guest House (1987), the Chiat/Day Building (1991), the Barcelona Fish or Peix completed for the 1992 Summer Olympics, and the Beekman Tower/New York by Gehry at 8 Spruce Street (2011). This exhibition presents over 30 diverse process models from 1985-2012, comprising a wide array of materials and approaches that begin to illuminate the subtleties of Gehry’s thought—and working—process. 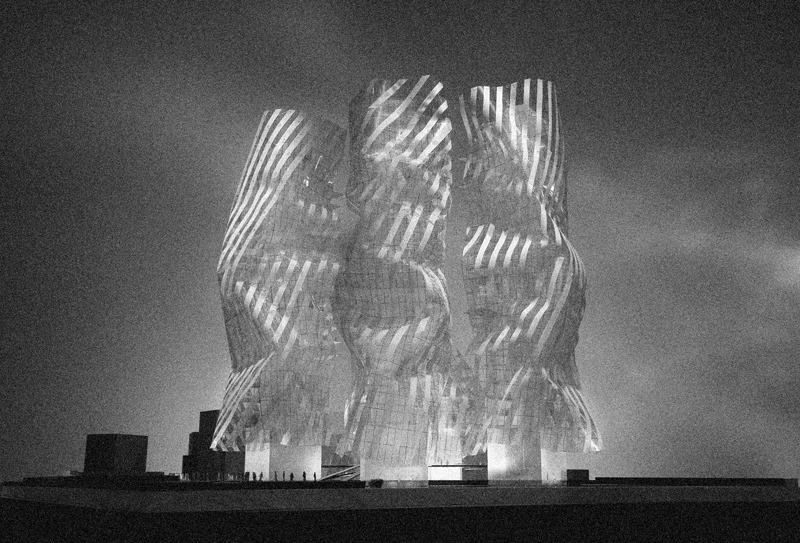 Several renditions of Gehry’s concept for Sonderborg Kunsthalle, for instance, experiment with varying shapes and degrees of fluidity embodied in the structure’s metallic skin. Studies pertaining to an unrealized tower for the Brooklyn Arena utilize materials ranging from basswood, vinyl, and plexiglass to gatorboard and paper. Each successive stage of a given model’s development illustrates the exploratory nature of Gehry’s practice, and the playfulness and originality inherent to his work. Distinguishing his methods from conventional, precision-based modes of development, Frank Gehry’s process is similar to that of artists, sculptors, and scientists. In a 1980 interview he explained, “It’s kind of like throwing things out and then following the ideas, rather than predicting what you’re going to do.” His models can therefore be understood as conceptual drafts, or three-dimensional sketches, integral to project development and design. Moreover, the structures are admirable in themselves as aesthetically beautiful sculpture. This show provides insight into Gehry’s indelible mind, one of the most brilliant—and provocative—of contemporary architecture and design. Photographic reproductions of his studio, the architect at work, and certain realized projects accompany the models on display. This exhibition reveals otherwise concealed aspects of Gehry’s process and practice, while simultaneously inspiring an array of new questions. Ultimately, these architectural studies culminate in a perceptive study of the architect himself. This is Frank Gehry’s second exhibition at Leslie Feely Fine Art, which also held his first ever gallery show in 2007 and featured his models at Art Basel Miami Beach 2011. Solo exhibitions including his process models have been presented by ArtisTree, Taikoo Place, Hong Kong, 2011; the Philadelphia Museum of Art, 2008; New York’s Solomon R. Guggenheim Museum, 2001; the Triennale Design Museum, Milan, 1997; and the Walker Center, Minneapolis, which organized a major retrospective of Gehry’s work in 1986. Gehry is the recipient of the Lifetime Achievement Award, Americans for the Arts (2000), the American Institute of Architects Gold Medal (1999), the National Medal of Arts, National Endowment for the Arts (1998), and the Pritzker Architecture Prize (1989). The architect graduated from the University of Southern California in 1954 and Harvard’s Graduate School of Design in 1956. Frank Gehry lives and works in Santa Monica, California. For more information please visit http://www.lesliefeely.com, email moc.yleefeilsel|yrellag#moc.yleefeilsel|yrellag, or call 212-988-0040. Frank Gehry At Work will be on display from April 11 to June 29, 2013. The Leslie Feely Fine Art is located on the 5th Floor of 33 East 68th Street, near the Northwest corner of 68th and Madison, and is open free to the public Tues-Sat from 10am-6pm.